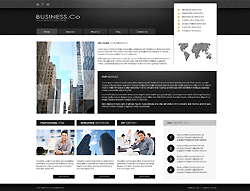 Working on your business website, think of it as the first impression prospective clients will have about you. Depending on how easy to navigate it is, how clearly you organize the layout, and how well you convey your companys products and services, it may or may not engage people in. We have decided to smoothen things down for you and provide an effective design to make audience get interested in your business at first sight. Statistical data showing your company growth will be an effective way of building trust. Be sure that dressing up your site with this theme anyone interested in your business will be able to reach you easily thanks to handy contact data and integrated Google Maps.